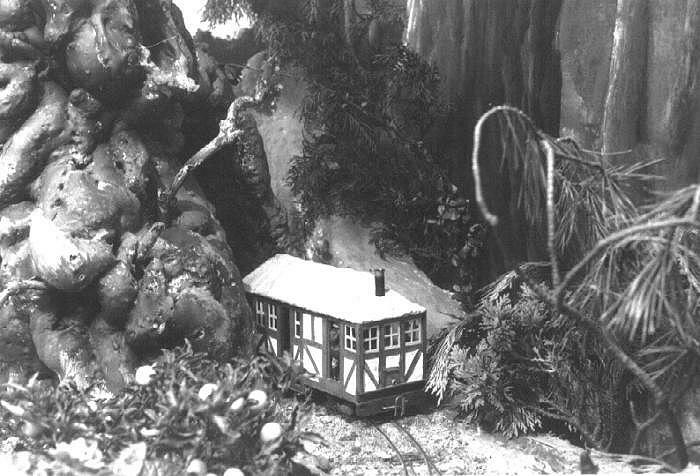 Gallery - Forest of Boland - The engines - "Perdim-Perdum"
"Perdim-Perdum" (a half-timbered, thatched, steam rail cottage), enters from beneath a gnarled old tree on the Forest of Boland Railway. indentOriginally called "Maggie" simply because it was thatched, this vehicle, now renamed "Perdim-Perdum", has curtains at the windows and a few passengers hanging on grimly as it rounds the tortuous curves. indentThe fern to the right was real, plucked freshly for every exhibition, while one of the many pot-plants which gave the layout its uniquely fresh greenery sits in the bottom left-hand corner. It was the only exhibition model railway we ever built which needed watering every evening.